We are delighted to have this adorable Little Hands and Feet diaper cake! 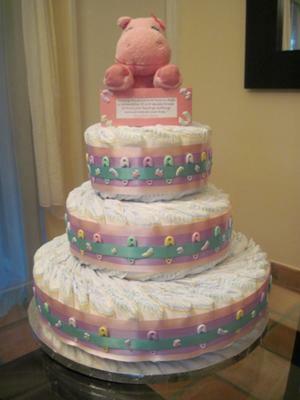 This precious, pastel diaper cake is perfect for celebrating a new baby. 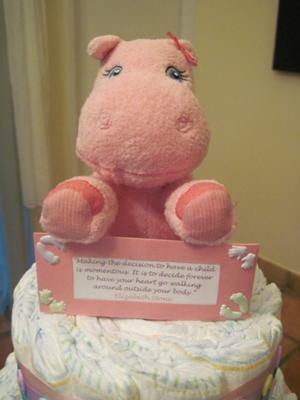 Rose is one of our fantastic readers who has "paid it forward" and shared her pretty diaper cake with all of us. It is folks like Rose who help the rest of us find much needed inspiration. Thanks for sharing Rose! If you have some diaper cake ideas and/or photos to share, please follow the link at the bottom of the page to send us your pics & ideas! This is my first diaper cake. The diaper pins, little hands and feet were each placed onto the ribbon individually. I decided not to add the baby products because I liked the beautiful simplicity of it and I felt that by adding the products the cake would look cluttered.